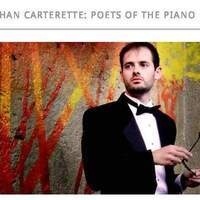 A lecture-recital with internationally known pianist-storyteller Nathan Carterette. The evening program celebrates the magic and poetry of piano music that transcends the instrument. The music explores the evolving art of piano music as composers tried to express more moods, scenes, and characters on the instruments. Behind each great piece is a story that will enrich your experience and open your ears to new possibilities. Carterette presents a 30 minute lecture followed by a 1 hour concert.